RUSH: There were protests in the NFL again last night. The NFL game last night, there were protests. But you know what? Nobody saw it. You know why? Because the TV networks didn’t televise it. You know why? Because the NFL is losing this thing and the players are losing this thing, and there’s no more power. No longer is there any strength. No longer is there any advantage for the Drive-By Media and the NFL and the players association to televise players disrespecting the anthem. The fact that they thought that was a good thing for them politically shows you how out of touch they are. There’s no reason, there’s no other reason why the media, the networks, and the players and the league all got together and televised all of these the anthems to show all of these protests, the kneeling, the refusal to honor the flag. They thought they were relating to a majority of Americans. I’m telling you, they’re warped in their view of what the American population is and who they are. And they are learning again — they learned it on election night 2016; they are learning it watching this Hollywood Weinstein story unfold. They’re learning it in the economy, by the way, with public sentiment on the economy and a near record high. Consumer sentiment in the U.S. is unexpectedly high, because they have no idea. They think you all are out there scrounging around in poverty because Trump’s president, because Obama’s no longer there, and since the government isn’t doing enough to care enough about the poor and the downtrodden, people are starving. They are so out of touch, the disconnect between the media and people inside the Washington bubble and the people in the rest of the county, this disconnect continues to expand. Hell, there’s no reason. They televise those protests, they televise the raised fists, they televise players taking a knee. Why? Because it was anti-America, and the media just sops that up. Anything anti-America, like Black Lives Matter or Antifa or whatever happens in Ferguson, Missouri, or Baltimore, anything. When they take cameras into a little pizzeria in Indiana and ask them if they would cater a gay wedding and the answer is “no,” they think they’re on the case. They think a majority of Americans are as disgusted with America as they are. And they quickly learn they are in the minority. There’s only one reason they stopped televising the protests, the kneeling and all of this during the anthem: It was hurting. It was not advancing the cause. And they’ll tell you, “There’s nothing different. We never televise the anthem normally. We only did this ’cause it was news.” Wrong. You started televising this because it fit your sentiment that there’s trouble in America, that America’s imperfect, that America’s impure, that America’s racist, sexist, bigot, homophobe, here is evidence; you couldn’t wait to televise it. And you made the mistake that that was the sentiment of a majority of people watching the NFL, and boy, did you blow that. Now they’re not televising it. That’s their solution to the problem. RUSH: We have Trent in Dallas. Great to have you, Trent. How you doing? CALLER: I’m great, Rush. Thank you. How are you? RUSH: Very well, sir. I’m glad you called. I like the subject that you have here. CALLER: Well, thank you, and I’m very proud to be on with you. 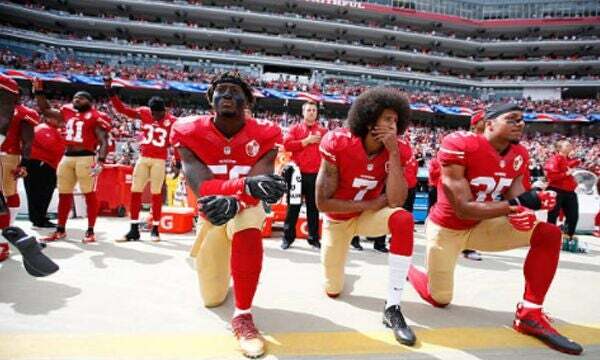 With regard to the NFL players’ protests, if the trend continues and the networks simply choose not to broadcast the images of the players kneeling for the national anthem, how long before the players and those that advocate for their position begin to specifically call out the networks as siding with Trump and being a part of the systematic oppression? RUSH: That’s a good question. Let me tackle this because last night there was a football game in Charlotte. It was the Carolina Panthers hosting the Eagles of Philadelphia. The Panthers all stood. Two players for the Eagles kneeled or linked arms and gave a black power salute, I think. But nobody saw it ’cause it wasn’t televised. CBS/NFL Network didn’t televise the anthem last night. I wonder why that might be? It’s obviously the league has gotten together with its so-called broadcast partners and said, “Hey, you know what? “The solution here, at least immediate, is don’t televise it.” Trent, if this keeps up, here’s what… I don’t… The player may lodge a complaint about it, via the union or whatever, individual players. But that’s not what they’ll do. What they will do is make the American flag somehow part of a touchdown celebration and do something with it where everybody’s watching. It won’t take them long to figure out that if the anthem’s not televised, that they’ve gotta do something where they know it is — and after touchdowns is always televised and always replayed. So if a protest becomes part of a touchdown celebration, everybody will see it. RUSH: Now, back to Thursday night football. There’s a couple of ancillaries to this story. The ratings again last night were down, even though the anthem was not televised. There were a couple of protests. I think a couple of players for the Eagles raised their fists. The Panthers, Carolina the Panthers all stood. Malcolm Jenkins and Rodney McLeod each raised a fist into the air with teammate Chris Long of the Eagles appearing to show solidarity. And so here’s what’s gonna happen. This is like the Democrats believing their own polls, their fake polls, and they were not accurate, and they led Hillary and all these other big-data analyst crunchers to believe that Hillary was gonna win in a landslide. No, no, no. There are protests. It’s just that the league and the networks have gotten wise and they’re not televising them. But they will be seen, because there will be countless people with cameras taking still shots. There will be journalist video and journalists can’t wait to show this stuff. So it’s going to continue to wreak havoc and cause harm. The league thinks they can sidestep some of this by pretending it’s not happening, by not televising it. So our last caller said, if the players figure this out, are they then gonna start protesting to the networks and the league for not televising the anthem? Yeah, maybe. But I firmly believe that — and all it’s gonna take is one team to do this. Come up with a protest that’s part of an end zone celebration after a touchdown. “But, Rush, but, Rush, there are penalties against that.” Yeah, and it doesn’t stop them from protesting or celebrating illegally now. There are things that you can’t do in celebrating a touchdown. The league has rules on this. That’s why the players call it the no-fun league. Well, you remember Terrell Owens scored a touchdown once and somebody stationed near the end zone, he grabbed a sharpie, and he autographed the football and gave it away. Well, that was an immediate penalty, because that was not permitted under the laws of the NFL. It wouldn’t be that hard for somebody to have an American flag or some other symbol of America, and if the player involved scores a touchdown, runs and grabs whatever that is, the flag, and starts running around with it or steps on it, whatever might happen, in the form of celebrating the touchdown in the end zone. I guarantee you, something like this you can almost make book on the fact that it’s gonna happen. If these guys are denied the visibility of their protests, this is what will happen. And their creativity is gonna be applauded and their bravery and their courage, and harm will continue to be inflicted on the NFL, because that is the objective of all of this right now. RUSH: Kyle in Port Clinton, Ohio. We go back to the phones. Great to have you on Open Line Friday. Hi. CALLER: Nobody says it better no matter what “it” is. RUSH: Ho! That is a promotable promo line: “Nobody says it better no matter what ‘it’ is.” I thank you very much for that. CALLER: Proof of it was what you said about the FCC earlier. That was exciting just to listen to. RUSH: — and the apportionment. CALLER: How you explained that. Yep. Well, it seemed you weren’t getting the golden iPhone response to Goodell’s response yesterday you were looking for with the callers, and I thought maybe that I had it. I thought, it seems to me that Goodell doesn’t know what position to take. RUSH: Let me reset this. Hang on just a minute, Kyle, ’cause not everybody might remember. I played a statement from Goodell that he made yesterday morning on the NFL Network, and it was that no new policy requiring the players to stand had gone in to practice. They hadn’t put it in play. They wanted to have meetings with the players starting next week to figure out how to balance the needs of the league with the players doing whatever they could do for the improvement of their communities, blah, blah. I asked people to call and tell me what they think Goodell was actually saying. So that’s what Kyle here is doing. So now, start again, since people know what you’re reacting to. CALLER: Okay. Well, like I said, I think it seems to me that he doesn’t know what position to take and he sounds weak in his response. He fears the players because too many are uniting, and if he tries to do some form of punishment and it doesn’t work out, he loses face with the owners. So he’s trying to pass it off to the owners because his job might be in jeopardy. And if he looks weak, you know, his job is in jeopardy. He wants the owners to figure it out and quell the players. That’s what my take is on it. RUSH: It’s an interesting take of yours, I have to admit. The NFL is structured this way. You have 32 men — families — that own teams in the National Football League, and they all cede the power of running that league to one man, the commissioner, whom they elect. The commissioner now makes in the neighborhood of $40 million to $44 million a year. It’s a good gig, but it’s fascinating to me that these families, these men… In some cases, like Amy Strunk in Tennessee, she’s the daughter of Bud Adams. She runs that team, and you have Martha Ford running the Lions. She’s the widow of William Clay Ford. So you have some women running teams. How they willingly abrogate so much of the power of running “the league” to the commissioner. Which I guess, you know, you have one business with 32 franchises is what it is, and so Goodell is essentially the CEO, but h e doesn’t own anything. The owners are the ones that have the equity, and yet they cede the power of suspension of players and discipline of players to the league office. Some teams have their own individual policies as well. But if you ask me, when it comes to this anthem business, this is an ownership issue. The players are employed by the owners, not Goodell and it not the leaking. The teams, the clubs employ these people, and I think the owners passing the buck to Goodell, it may be commonplace with other areas of league operations. But you’re right: Goodell’s trying to have it both ways here. I mean, everybody needs the players or you don’t have product to put on the field. So you need ’em happy and showing up and competing trying to win, which is what the owners want to do. So there’s a lot of reluctance to treat the players as parents would treat children. So the inmates get to run the asylum here, and there is a fear and they all know what the right thing to do is here. They just don’t have the guts to do it. They all know. Nine out of 10 of these others know the right thing to do to stop this but are afraid to pull the trigger on it. So they hide behind, “Well, I’ve talked to my players. We want to work with our players, make sure they understand it, the great work they are doing on promoting goodwill in their communities and so forth. “We don’t want to hinder that whatsoever. You know, we want to make sure our players understand that we are,” blah, blah, blah, blah, blah. The NFL’s not about communities. They just did charity stuff and PR stuff like this to get away with charging high prices. That’s not why the NFL exists. So you probably have a good point here about why the commissioner said what he did. By the way, there’s something else about the commissioner. It was discovered… His wife is Jane Skinner. You people that watch Fox News, you might remember Jane Skinner. You didn’t know that Jane Skinner was Mrs. NFL commissioner? Jane Skinner, she’s the mother of their three daughters, and she left Fox News some years ago to… Well, I don’t know what else she’s doing, if anything. But she did so in full support of her husband. Well, it turns out that she has had a private Twitter account that when her husband’s being roasted, she’s gone on that Twitter account and has defended him and has lashed back at some of the people attacking him. Nobody knew it was her until this week. So the commissioner and Jane Skinner being ripped to shreds for this. Would somebody tell me what’s wrong with it? What’s wrong with a wife defending her husband? I mean, everybody’s been… The long knives have been out for Goodell for I don’t know how long. Everybody hates him. The Drive-Bys hate him and they gin up hatred for the guy. Fans hate him, everybody. It’s fashionable to hate Goodell. So what’s wrong with his wife having a Twitter account to defend him? “Well, it was invisible Rush! Nobody knew it was her.” Okay, fine. Maybe that could be… But is he not entitled to have somebody that loves him to death defend him? What’s so bad about that? It seems cockeyed to think there’s something suspicious with that. RUSH: Robert Kraft, the New England Patriots, says he’s not gonna make his players stand. He thinks Trump is ’til being too inflammatory; whatever his players want to do is fine with him. So the issue is not going away any time soon.